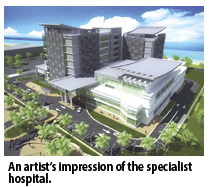 KUALA TERENGGANU: TDM Bhd has received the state government's approval on the lease of land in Batu Burok to build and operate a new 130-bed specialist hospital. Chief executive officer Badrul Hisham Mahari said the new hospital will cost RM170.2 million, excluding the cost of the lease of the land and incidental fees. "It will be financed by internally generated funds and/or bank borrowings, which the board has yet to decide," Badrul Hisham said after the company's shareholders meeting yesterday. Chairman Datuk Roslan Awang Chik said the new eight-storey hospital will replace the current Kuala Terengganu Specialist (KTS) hospital which is operating near maximum capacity. "The hospital, on a 23,424 sq m land, will be the city's flagship specialist hospital that will serve about 338,000 people of Kuala Terengganu," he said. Roslan said construction will start immediately after the completion of the lease documents, to be signed with Tabung Amanah Warisan Ne-geri Terengganu, owner of the land. The hospital is expected to be completed within 24 months. It will provide more comprehensive healthcare facilities, accommodate more in-patients, operate more specialist clinics and other quality healthcare services, Roslan said. Its features include five operating theatres, a 12-bedded intensive care unit (ICU) and one-and-a-half storey car park with 281 parking bays. The current KTS Hospital has 33 beds, a two-bedded ICU and two operating theatres. It also offers consultancy services on general surgery, obstetrics and gynecology, orthopaedics and anaesthetics. On TDM's healthcare division, Badrul Hisham said with an average 12 per cent increase in the number of patients since 2007, it has recorded consecutive average annual increase in revenue of RM31 million. For the past four years, the division contributed an average of seven per cent to the group's pre-tax profit.